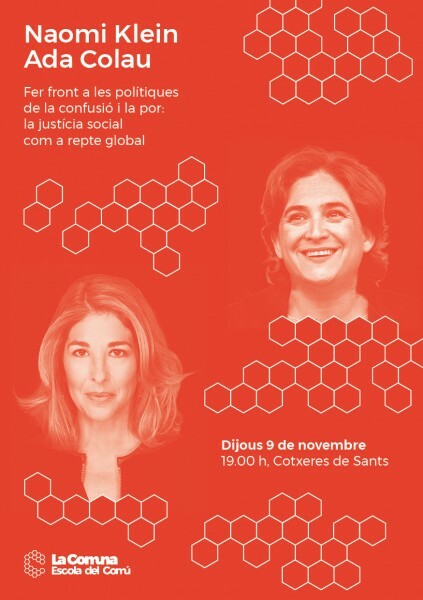 Standing in a Spanish Doorway: Colau and Klein debate in Barcelona: "Facing the politics of change and fear"
Colau and Klein debate in Barcelona: "Facing the politics of change and fear"
This Thursday the 9th of November at 7pm the Barcelona Mayor Ada Colau and progressive international author/journalist Naomi Klein will be speaking together. In a very timely moment for this part of the world in particular, the organisers say that "the starting point of this debate will be the imposition by antidemocratic powers of global policies that challenge our lives, our security and survival..."
The event is open to all the public but seating is limited to 700 people. It will also be broadcast live on their Facebook Live and the YouTube channel of La Comuna, Escola del Comú. There will also be a simultaneous translation service and translation into sign language.